In 1960 the twenty-five thousand Dani tribes people hidden away in the remote Toli Valley of Irian Jaya used only stone tools and had no written language. Then, in one generation, they took the always dangerous, sometimes fatal, leap from the Stone Age into the twentieth century. At this critical time John and Helen Dekker gave themselves to the Dani, helping them discover the gospel of Jesus Christ and their destiny as helpers of other tribes. Today the seventy-nine churches of the Toli Valley, with thirteen thousand baptized believers, have sent out sixty-five couples to other tribes needing the gospel. 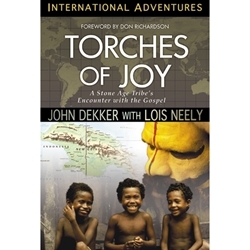 A chapter from a present-day Book of Acts, Torches of Joy is a model for cross-cultural mission strategy and one of the twentieth century's most striking chronicles of God's grace and power.